For a team so full of promise, the 2017-18 season was an abject failure for the Oklahoma City Thunder. They were, however, top 10 in both offensive and defensive rating and the best offensive rebounding team in the league (thanks in large part to Steven Adams). Russell Westbrook continued putting up ridiculous stat-lines, averaging a triple-double for the 2nd season in a row. His partner in crime, Paul George, was awesome from the perimeter (40.1 3P%) and was unlucky not to nab a spot on the two All-Defensive teams despite finishing 10th in defensive win shares. In comparison, the duo’s teammate, Carmelo Anthony, had a lacklustre season. He didn’t mesh well in the role coach Billy Donovan wanted from him and that was highlighted in a disappointing playoff run for the Thunder. OKC’s first round exit to the Jazz, while a statement moment for Utah, was a series to forget for Oklahoma City. They won game 1 after an impressive outing from Paul George but lost 4 of the next 5 games after a severe lack of support for the team’s two stars. The injury to Andre Roberson was a key turning point for OKC and their success overall. As expected they were hit most hard on the defensive end. The increased burden on the defensive side for Paul George meant he had less energy to be the offensive weapon he’s shown countless times throughout his career. It was a ripple effect that left the Thunder forced to turn to avenues that weren’t necessarily their number one preference. With all their misgivings last season, center Steven Adams showed that he can fill the void of being the third go-to guy following the departure of Carmelo. Adams finished last season with the 4th best effective field goal percentage and 2nd best offensive rebounding percentage. With all their ups and downs last season let’s take a look at the Thunder’s goals for 2018-19. Perimeter shooting is an integral part of every NBA offense. Last season the Thunder took the 11th most threes (30.4 per game), made the 15th most (10.7 per game) but were 24th in 3-point percentage (35.4%). Of the players in their main rotation only 4 Thunder players exceeded that mark: Paul George (40.1%), Patrick Patterson (38.6%), Alex Abrines (38%), Carmelo Anthony (35.7%). One of the many players who shot poorly from deep was the team’s franchise player. Westbrook shot under 30% from the arc (29.8%). For players who shot 250 or more perimeter shots for the season, Russ had the 2nd worst percentage. The player with the worst? His new teammate Dennis Schröder. According to ESPN’s Royce Young, the Thunder superstar has been making the 3-point shot a focal point of his workouts this summer. A large portion of the game’s best players have made the perimeter shot a key area in their game and for OKC to take the next step they’ll need Westbrook to do the same. Not once in his 10-season career has he hit the 35% from the arc. The closest he got was in his MVP year where he made 34.3% of his 7.2 attempts per game. 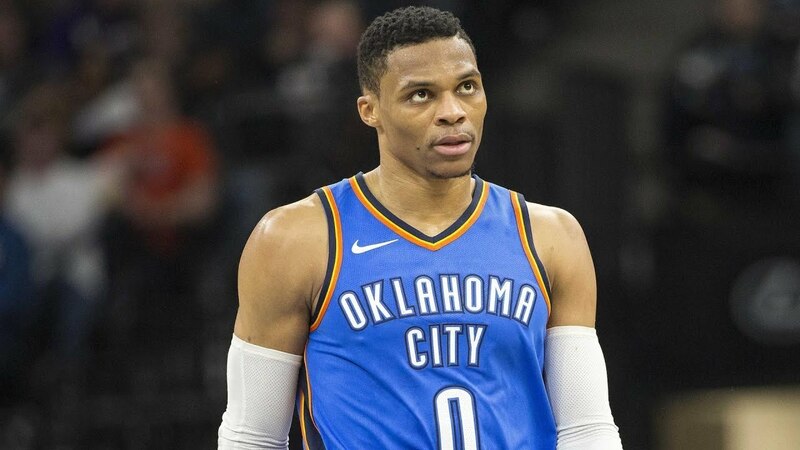 For the Thunder to elevate their perimeter shooting they’ll be looking for the former MVP to make closer to his career mark but on a lesser volume. Last season the Atlanta Hawks finished right in the middle of the pack with a 3-point percentage of 36%. Alongside Westbrook’s improvement, if the Thunder can get more out of Patrick Patterson and second-year guard, Terrance Ferguson, there’s every chance that they can make the necessary improvements to crack the top-15 in 3-point shooting percentage. Last season OKC were top 10 in both offensive and defensive rating. In 2018-19 they’ll be hoping to repeat that effort, if not improve it. The top-tier teams in the league are usually at least top 5 in one if not both areas. For example, Boston were the best defensive team and Golden State and Houston were 1st and 2nd on the offensive end respectively. It’ll be a tough ask for the Thunder, but it’s something they should aspire to if they’re looking at improving on their win total and postseason run next year. As is for most teams, the key for OKC reaching the potential on both sides of the floor will be health. Despite the loss of Andre Roberson for a significant chunk of time last season the Thunder were still the healthiest team in the NBA when it came to games lost. A fit Andre Roberson for all 82 games will certainly help improve their defensive rating but outside of that there’s not much more they can do. Their new additions in Dennis Schröder and Nerlens Noel will provide markedly different skills on both ends. Schröder was one of the worst defenders in the NBA per ESPN’s defensive real plus-minus. His role as a backup guard should bode well as he won’t be asked to defend some of the game’s elite offensive players, as was reiterated by Peachtree Hoops. The former Hawk has shown glimpses of defensive prowess but the Thunder will be hoping he can be more engaged in a new role for a contending team. Nerlens Noel will most likely see minutes as a backup center and a possible power forward in specialist defensive lineups with Westbrook, Roberson, George and Adams. Jerami Grant was great for the team as a small-ball backup center who could sometimes stretch the floor and he would often close games so Noel will have to battle to earn his playing time. If given the chance he’ll certainly give the Thunder plenty of upside not just defensively but as a rim-running threat as well. The last time OKC made the Conference Finals was in 2012 when they defeated the San Antonio Spurs. This season they should be looking to get back there, even if the odds are stacked against them. Fivethirtyeight has given them the 7th best odds (9%) of making the Finals with a projected win-loss record of 53-29. ESPN meanwhile gave them an even worse win-loss projection of 49-33, leaving them 4th in the Western Conference standings. For the Thunder to overcome and exceed those projections a lot will have to go right for them. If they can improve their 3-point shooting and become an elite team on at least one end of the floor then they’ll definitely make strides in achieving that goal. Conference rivals, Houston will need to regress which is entirely possible. They should also aim for a higher seed to avoid a possible tough early round matchup like the one they encountered with Utah last season. Whether the Thunder can make Pierce’s prediction come true a year later will come down to a lot of factors. They’ll be banking on the internal development of Adams, Ferguson, Schröder and Noel, all who are aged 25 or under. There’s nothing to say all those players don’t make a jump and the addition by subtraction of offloading Carmelo should lead to an improved record. Anthony’s departure should also lead to better on-court chemistry, especially with the team’s two main stars, as was further stated by ESPN’s Kevin Pelton.